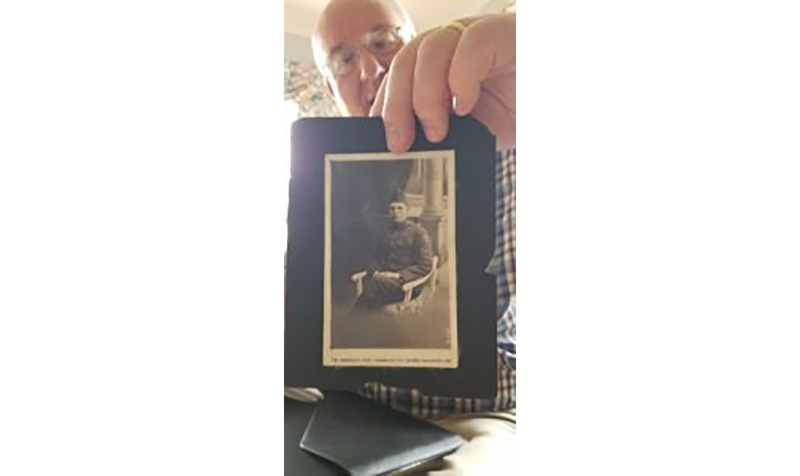 Dan Murphy holds a World War I picture from his WWI files of Walter G. “Toad” Harmison of Morgan County.been giving presentations of what life was like during the war, both at home and in Europe. Each month during the town meetings, Murphy would also give a snippet of what local soldiers were doing as they prepared for war and eventually in the war. HANCOCK, W.Va. — This coming Sunday, November 11, is Veterans Day and also the 100th anniversary of the end to a war that was to end all wars – World War I. And to commemorate the anniversary, there will be a WWI presentation at 4 p.m. in the Hancock Community Center. Over the past few months, former Hancock mayor Dan Murphy and the Centennial Commission have been giving presentations of what life was like during the war, both at home and in Europe. Each month during the town meetings, Murphy would also give a snippet of what local soldiers were doing as they prepared for war and eventually in the war. In his first presentation, Murphy has talked about the guns and uniform along with an in detail history of the Great War. He described it as heavy duty for those who aren’t into history.